We lust for wind. Sometimes we get more than we can handle, mother nature is like that. When it happens things can get ugly, gear can get trashed and so can riders. 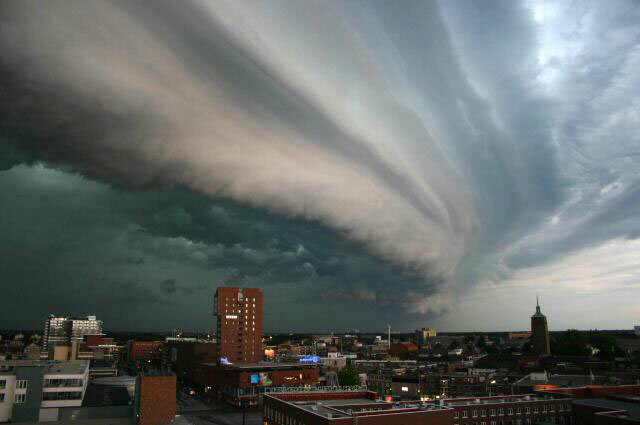 A shelf cloud in Holland. These clouds can bring sudden gusts, tornados, microburst, wind direction shifts and more irregular weather. A pretty fluffy cloud likely containing a supercell(s) with the capacity to throw out microbursts, tornados and high, violent wind gusts off Boca Raton, FL, USA at dusk. Hey, I've got a BOW kite, flat kite or Super-Depower C kite, I can handle it. Not if you don't react properly in time or if your system is poorly maintained or if it malfunctions or if after activation you STILL have too much kite area up. Kiteboarders using the newer designs in higher winds have been injured and even killed largely due to choosing to be in the wrong place at the wrong time. Choose your kiting weather well and monitor it while you are out. Last edited by RickI; 09-20-2018 at 07:10 PM. Check reliable forecasts (predicted winds, direction, HAZARD FORECASTS, temperatures, anticipated changes, cold fronts, tropical or strong systems). Anticipate changes don’t fall into them. Not all private weather sites are reliable, use what works well in your area. Will your kite size work for the day or will you need to increase or decrease size at some point. How about exposure clothing, is there a sudden temperature drop inbound? Is stormy weather (often bright colored masses), squall lines, isolated storm clouds or feeder bands inbound? Looping weather images can show CURRENT trends and speed. Does it look they will arrive during your session? Temper this with LOCAL knowledge as conditions can change radically in only an hour sometimes, systems can accelerate or stall, etc..
Are there significant weather systems inbound, cold fronts, tropical systems, strong high/low pressure, got tight pressure isobars for strong wind? Look at these maps on loop again to learn about CURRENT trends and speed. How are winds upweather or the direction of the prevailing system, spikes/gusty and shifting winds inbound? Frequently you can see a preview of what the front will bring to your area, hundreds of miles upweather in advance. It’s a free look at what may be the future, why not take it? If unstable weather is coming avoid it until it passes. If you decide to go, STAY AWARE, at all times of the weather. Things like cloud lines, funnel clouds, wind direction and velocity, white caps, mist, temperature changes. Typical weather patterns can be recognized within given seasons. Learn what to look for and when to react. Good chance you are a wind junkie already so play the complete roll and tune into wx. Measure wind speed at the launch along with other visual indicators such as white caps, tree and flag movement and ask how other kiters are doing on their respective kite sizes before selecting yours. If you expect a weather change to occur, don't be on the water if something violent comes through. Sometimes the hazardous period can be short so just wait it out. Checkout wind speed, direction, sky and water conditions at the launch and during your session. Is the wind useable, are sky conditions stable or threatening? What do threatening sky conditions look like in your area? You should know. Are there dark clouds and/or a wind/whitewater inbound? What about funnel clouds or waterspouts, are there small points showing up at the bottom of clouds? Always be aware of your surroundings, weather changes, ANTICIPATE & REACT early. Land, thoroughly secure gear early, before significant wind, temperature changes or threatening weather arrives. Systems can move 50 mph + hitting with minimal warning. If caught on the water, consider totally or emergency depowering early, waiting too long has taken riders. Be ready to release your kite leash if your kite powers up again. Riding out far from shore may work for ships. Ships don’t get ripped 50’+ from the water and blown at high speed downwind. DON'T WAIT, act early to kill the power of the kite even if it means swimming in after. Your strong swimming skills and impact vest should make that a manageable process. Last edited by RickI; 06-29-2009 at 06:01 AM. Not all cold fronts bring violent weather, some do however. Often indications of heavy weather are fairly obvious from weather records such as the example from March 2005 that appears below. Sometimes you can time your session to AVOID the squall line at the leading edge of some fronts. This particular front had more than one however. 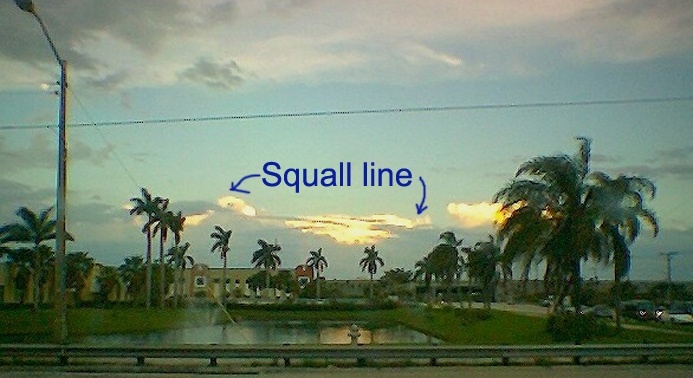 The color radar showed several squall lines of potentially violent weather. 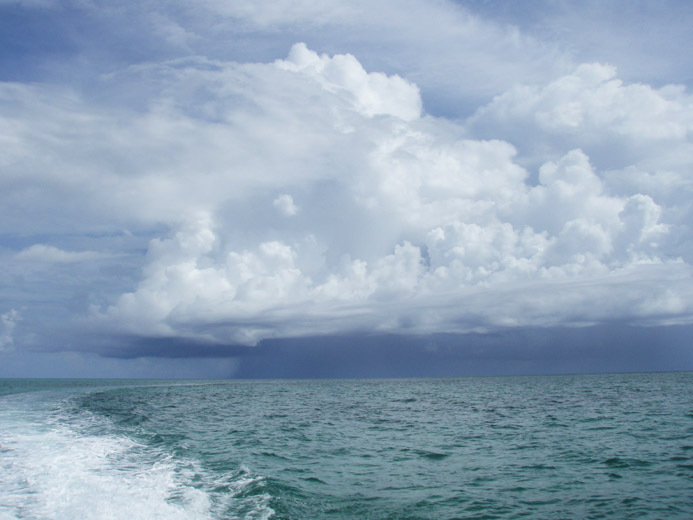 This station on the west coast of Florida had already been hit with strong squall gusts. Note the 90 degree direction change typical of frontal winds and the irratic direction changes common in squall gusts. That isn't a blow torch flame roasting Florida but in fact a color enhanced satellite image of a "weak" cold front. The weather map showed a frontal boundary sweeping across the southeast with SEVERE thunderstorms possible. One of the squall bands off to the east, over the ocean at about 5 pm. All that blue sky and that big nasty band on weather clear as day. The squall line at the leading edge of the front strikes SW Florida near Marco Island and the wind spikes up to at least 40 mph, possibly more. Note the classic 90 degree direction change in the wind. Enhanced color radar and satellite imagery from around 3 pm with the SW coast getting struck by the squall line. More imagery from TWO hours later at 5 pm. Good Rules Of Thumb ConchExpress. I particularly like the one about wind shifts with passage of cold fronts. A big wind boost and squalls can also come through around the same time. The frontal wind shift often seems to be about 90 degrees in a clockwise direction. In some cases this leads to sudden, power offshore winds which were previously lighter and onshore. This blew a kiter out to sea in Connecticut a few years back. It also sent some Panhandle kiters in a kayak trying to recover a kite out to sea for a cold night of floating around. Cold fronts are rarely a secret and you can even guess fairly accurately when they may cross your location. No real excuse for getting caught out by a hazardous wind direction shift, getting caught in a squall line or being yoked by predicted wind spikes at the leading edge of the front. Coming from flying, what things are you particularly tuned into when it comes to kiting weather and precautions? I have one piece of equipment in my plane that I won't fly without. It's a Garmin 396 GPS that has XM satellite weather. It's not as up-to-date as on- board real time radar, which is quite expensive, but it does give relatively timely Nexrad radar information which is usually updated every couple of minutes. In addition it gives winds aloft, lightning strikes, cell movement, cloud levels, and individual reporting station weather, as well as severe weather alerts. Apart from the initial cost of the unit, the XM weather is 9.95/month. I can also get XM radio with it, just in case I get bored. It can function on battery power alone, and could be used quite easily on the beach. I think the most worrisome thing that we as kiteboarders might have to deal with are microbursts and their associated gust fronts. Gust fronts happen to some degree with every mature thunderstorm, and it's the increase in a cooler wind that we feel in the face of an approaching TS. However, it emanates in a radial pattern from the cell and can be felt even if the storm is moving away from us. Normally the increase in wind is usually in the 10mph range. But with an entity called a microburst, conditions within the cell accelerate the downdrafts and the wind increase can be quite significant. Some gust fronts have been clocked at 168mph, but typically they are more in the range of 60mph with this type of phenomenon. As the gust front moves outward, friction from the ground or base causes the leading edge to roll upward causing a severe wind shear. How would you like to get lofted by a 60mph updraft? Microbursts were once thought to only occur with supercells, but now are known to occur with your run of the mill airmass thunderstorms that make up our summertime pattern here in Florida. Airmass TS are the result of the differential heating and cooling of the surface, and are not usually associated with a frontal line. The safe rule of thumb in flying is to give all thunderstorms a 20 mile buffer zone. They bring down Jumbo jets, so imagine one measly kiteboarder. There was another severe lofting in Portugal in 2005, one I have learned little about unfortunately. One newspaper account puts the height of the lofting at over 325 ft. and distance downwind of over 1750 ft.. I have no details about the weather that contributed to this tragic event. I have to wonder if it might not have been some form of burst. It happened to a well experienced commercial airline pilot out kiteboarding.